Queen of the Clan: Kansas City & Pennsylvania Temple Locations Announced! Kansas City & Pennsylvania Temple Locations Announced! One of the Church’s 128 completed temples. Designs for the five new temples are still in process. The Philadelphia temple will be built in downtown Philadelphia, at Spring Street and Broad Street. Several other temples occupy urban sites, including those in Manhattan and Hong Kong. No designs have been completed for this temple or the others announced on Saturday. The temple in Córdoba, Argentina, will be situated on the Belgrano meetinghouse site, next to the present mission home of the Church, and the Calgary temple will be built on Church-owned land next to an existing chapel in the northwest part of the city, at the intersection of Rocky Ridge Road and Royal Oak Road. In Rome, the temple will occupy part of a 15-acre Church-owned site near the ring road skirting the northeast section of Rome. The new Kansas City temple will be located about 35-45 minutes from our house! I am so excited! It will be so awesome! It's located off of MO 152 between I-435 & I-35, not far from Liberty Hospital. 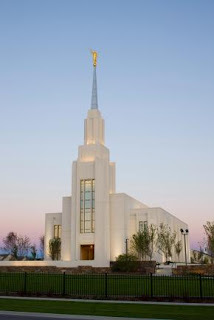 For all you Utahns, it will be similar to driving from Orem, UT to the Jordan River Utah Temple. Yeah! Heather - Thank you. I'm very excited about the temple! Which Twilight Chick Are You? I Am a Child of God, Just Like You. Pumpkins, and Races, and Painting - Oh My!